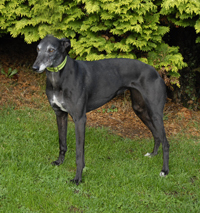 Went to her new home on Sunday 22nd December 2013. 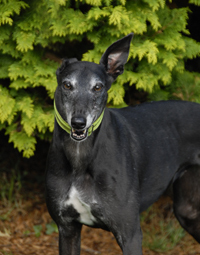 Bo is a lovely black ex-racing Greyhound who is the spitting image of our Indi at the same age - even down to the ears! 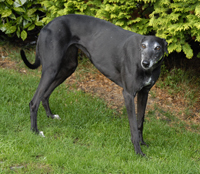 She is a loveable and friendly girl who knows her name and loves being cuddled. * The branch kennel at the bottom of our garden is where Bo and the other resident(s) will be for the first day or so until he gets to know the other greyhounds. He has use of our garden and paddock, and once he gets to know the other dogs he will be allowed in the house during the day and all the dogs will then take it in turn to sleep in the house at night, so they become use to sleeping in both the kennel and the house. Bo arrived with Alfie this afternoon around 2pm. Both happily wandered around the garden, then we introduced them to the dogs already in the kennel. Once in the kennel we put Bo and Alfie in separate sections and closed the gates so they could see and be with the other dogs, yet still be on their own during the 'get to know each other' period. Bo is settling in very well and is a lovely friendly girl who enjoys running around the garden with the others. At first she was a little funny with her dried food, which may have been because it was different to what she was used to, but as time has gone on she's got better at eating it, but is much slower than the rest. At some stage in her past she may have been shouted at or even hit because if you approach her in a certain manner or go to stroke her with the palm of your hand to the top of her head she will back away and squat on the ground. This we hope will disappear in time as she gets to know us. This morning Bo went to the vet to be spayed and have her first inocuation because she arrived with no inocuation details. She weighed in at 29.3k, had a full examination, her first inoculation and was spayed. When we called to collect her from the vet this afternoon they mentioned that while they were spaying her they found a cyst on or near her womb, which they removed. A blessing in disguise that we had her spayed! They also mentioned she had a loose tooth that needed to come out and her teeth cleaned, which we shall arrange to do once she has recovered from her spaying. She is on Metacam and antibiotics following the removal of the cyst and the vet wants to see her again in a couple of days to see how she is recovering. Upon arriving home we didn't put Bo back in the kennel, but instead brought her in the house where she will stay until we find her forever home. Bo visited the vets this morning for a check-up following her operation on Wednesday. All was well and the vet was pleased with the way it was healing. This afternoon Bo went to the vets to have her stitches removed and be given her second inoculation. She was as good as gold while in the vets and her operation area had healed well, so arrangements were made to book her in for her dental. This morning we took Bo to the vets for her dental. In the waiting room she saw some cats who she didn't bother about, just ignored them. The vet removed a loose tooth, which may have been the cause for her eating her food in a funny manner and the rest they scaled and polished. Back home again and it wasn't long before she was asking for her dinner. All eaten, in the garden to do her toilet then fast asleep on her bed for the rest of the evening. Bo has shown no interest to climb on our bed nor on the settee, however, she likes to sleep on the dog beg by my side of the bed, in the crate with the door open or on the dog bed in the living room in the corner snuggled between two sofas. Nigel visited this morning and walked some dogs for us. He usually takes two at a time, and Bo was one of those he took this morning. She loved it, he said she was fine and she walked lovely on the lead. This afternoon Bo went off to her new home where she will be living with 3 King Charles Spaniels.